I am a Weather Geek. And that weather geek is twin to my inner menu-planner. Last Thursday I got really excited after checking the weather forecast – 100% chance of rain all weekend! We had a really, really, really mild winter in Southern California this year. And for someone who cooks/bakes according to season and temperature it was tough to get motivated. It wasn’t consistently cold enough for stews, casseroles and baked goods, nor was it consistently warm enough to grill or throw together salads at every meal. Basically, I was stuck in a temperature induced cooking purgatory. So, when the temperature finally dropped below 50 degrees, I decided to make one of my all-time favorite chilly weather recipes – Chicken Pot Pie. I grew up eating Swanson chicken pot pies, (usually reserved for Friday nights with a babysitter,) and my favorite part was the crust. I’d pick it off in little chunks and slowly nibble on it until the interior cooled enought to eat. Ages ago I found a recipe in Martha Stewart’s, “Favorite Comfort Food”, but characteristically, her version called for specific ingredients I really had no interest in sourcing. (Button mushrooms, baby carrots, pearl onions, spring leeks….ugh! Martha!) So I modified it to accommodate the ingredients I could find and the tastes I preferred. 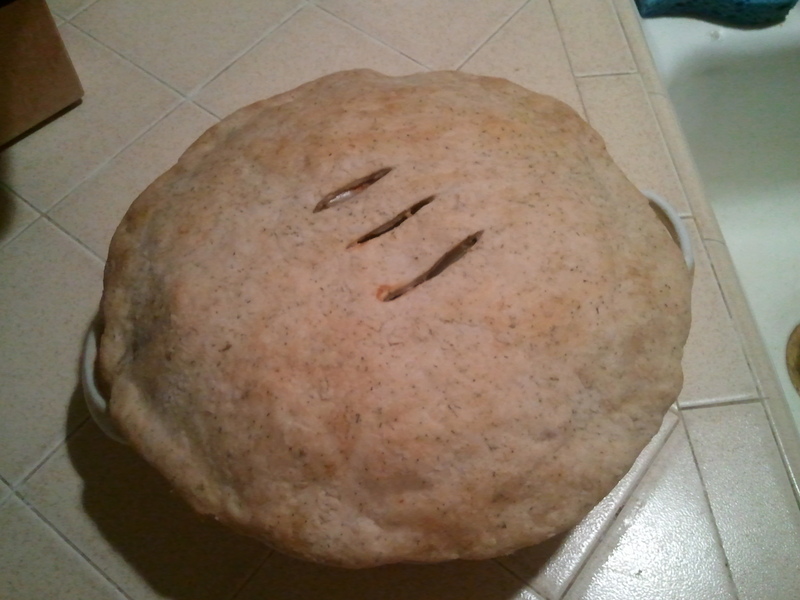 First, I decided to use my own pie crust recipe simply because it is AWESOME, although I did add dried dill and thyme to make a savory crust. I also opted for more traditional, (read: more like Swanson) ingredients – so I used carrots, potatoes, peas and mushrooms. For the most part, I never make my Chicken Pot Pie the same way twice. Sometimes I use leftover chicken stock, other times I doctor up some organic broth if I have it in the pantry. I’ve used the whole chicken (which is much better) but I’ve also used boneless, skinless parts when I’m in a hurry. I’ve also substituted vegetables, but the above-mentioned are my favorite. 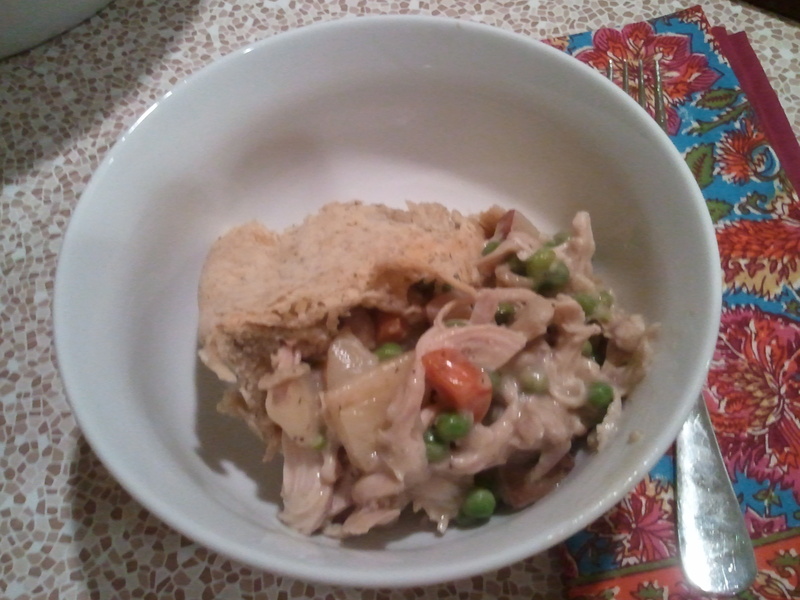 This weekend I made one of the best chicken pot pies I’ve ever made. Really – I’m eating leftovers as I write this and I think they’re even better the next day. In fact, I’ve managed to finish the slice before I’ve finished this post. Place the chicken, broth, onion, celery, bay leaves, peppercorns, 2 tbsp dill and 2 tbsp thyme in a large stockpot. Add enough water to cover the chicken and bring to a boil. Reduce heat and simmer 1 hour. To make the crust, mix 3 cups of flour with 1 tbsp dill, 1 tbsp thyme and salt in a large bowl. Add shortening and mix well. Add water 1 tbsp at a time until dough is blended and slightly sticky. Set aside. Drain the chicken and strain the stock, setting aside 2 cups. Remove the skin from the chicken and discard. Remove all the meat from the carcass and shred into bite-sized pieces. Place in a large bowl and set aside. Heat the oven to 375 degrees. Roll out half of the dough until it is 1/2″ thick and line the bottom of a pie dish. Roll out the other half to 1/2″ thickness and set aside. Melt the butter in a large pan and add the potatoes. Saute 4-5 minutes until they turn golden. Add the carrots and mushrooms and cook another 3 minutes. Add the peas and cook another 2 minutes. Add 5 tbsp flour, mix well with vegetables and cook 1 minute. Stir in milk and reserved chicken stock and bring to a simmer. Cook until thick and bubbly, stirring constantly. Combine the chicken pieces and vegetable/gravy mixture and stir to combine. Pour into the prepared pie dish and top with remaining crust. Cut 2-3 steam vents in the top and bake for 35-40 minutes. My mouth is watering as I read this. Gonna try this recipe. Thanks for sharing, Heather!